I am testing out Linux Mint Debian Edition (LMDE) and wanted to benefit from Firefox 4 and all its speediness. It’s not available in the repositories and since LMDE uses Firefox and NOT Iceweasel, you really can’t install it from the Mozilla Debian repository. So, I decided to manually install things. Normally I don’t like to manually install things outside the repository because when updates are pushed, there is no upstream source to differentiate from…so your chances of running outdated software increase unless you are vigilant. Luckily, I consider myself vigilant. Unfortunately, I’m not as vigilant as I consider myself to be…so I’ve added in reminders for myself on my Google calendar to check for Firefox 4 updates. So, here’s how to get Firefox 4 onto your LMDE desktop…First, uninstall the version of Firefox you have using Synaptic or the software center. Open a terminal up and let’s get started. When you’re finished, click close. Firefox 4 should now appear under “Internet” in your Mint Menu. You can now right click that item and add it to your favorites if you wish. 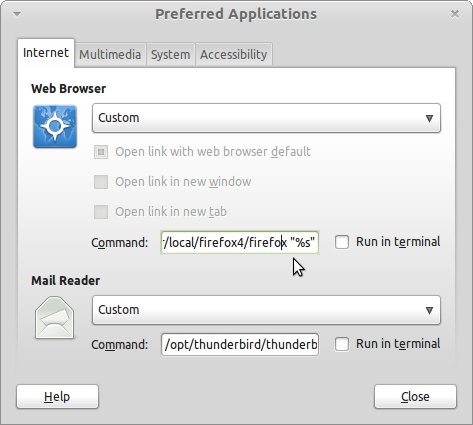 That should be everything you need to have a good Firefox 4 experience in LMDE. To uninstall things, you can simply delete the menu items and then delete the directories we created during the install process. 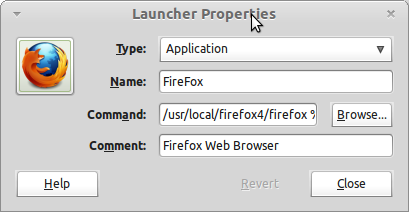 Hopefully this will help those of you out there who want Firefox 4 on your LMDE install!